Accidents happen. 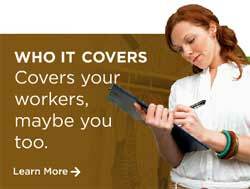 And even if you consider your workplace to be safe, depending on the state in which your business is located, you have a legal requirement for employee/worker compensation. Statland & Katz is prepared to find you the best coverage solutions for worker injury payments, lost time, rehabilitation services and death benefits for surviving spouses and dependents. Our staff are up-to-date on the latest state and local laws, and will make sure you have the right policies for the right times. Benefit from our extensive relationships with leading insurers to customize coverage, reduce risk and loss, and save you money. An 80-employee technology company and U.S. government contractor was able to save 50% on its insurance costs following a series of visits and safety inspections by Statland & Katz, which enabled the agency to re-classify the firm’s workers compensation.